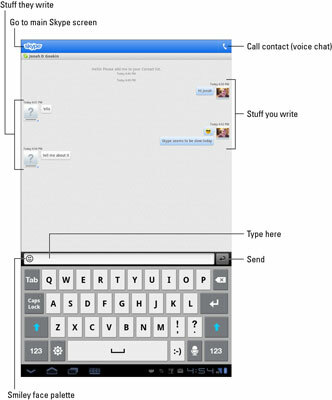 Basic functions on the Galaxy Tab’s version of Skype only connect you with other Skype users. These are free to use with your Skype account. Of these, the most basic functions use only text, not audio or video, capabilities. You have two ways to present yourself to the Skype universe. The first is your Skype mood, a message that’s always displayed. The second is the Skype status, which tells the Skype-o-verse how open you are to receiving new calls. 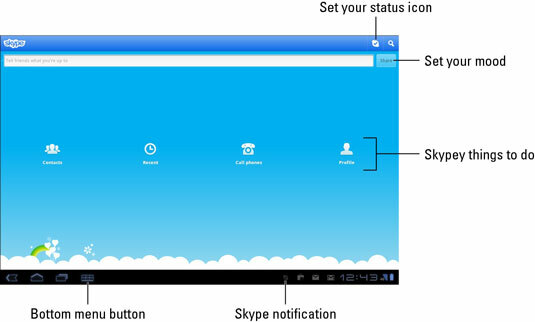 To set either your mood or status, touch the Profile button on the main Skype screen. Set your mood by touching the mood message next to your account picture. Type in some text using the onscreen keyboard. Set your status by touching the Status button at the top of the screen. A toolbar with a variety of status icons appears, describing whether you’re open for calls, away, or prefer not to be bothered. The Profile screen also lists how much Skype Credit you have. To purchase more credit, touch the Skype Credit button, whip out your credit card, and follow the directions on the screen. You can text chat with any Skype user, which works similarly to texting, though with no maximum-character limitations. The only restriction is that you can chat only with other Skype users. To chat, choose a contact from the Contacts list. You see a screen with more detailed information about the contact. Choose the option Send IM, where the IM stands for instant message. Providing that your Skype friend is online and eager, you’ll be chatting in no time. Type your text in the box. Touch the Send button to publish your comment. You can also use the Smiley button to insert a cute graphic into your text. The Skype Chat notification, shown in the margin, appears whenever someone wants to chat with you. It’s handy to see, especially when you may have switched away from the Skype app to do something else on the Galaxy Tab. Simply touch that notification to get into the conversation. You can add more people to the conversation, if you like: Touch the bottom Menu icon button and choose the command Add. Select the contacts you want to join with your chat session, and then touch the Add Selected button. It’s a gang chat! To stop chatting, touch the Back icon button. The conversation is kept in the Skype app, even after the other person has disconnected. For the chat to work, the other user must be online and available.